When it comes to regular home maintenance, chimneys are often neglected. Even when people do think to pay attention to their chimneys, they usually think of sweeping out the interiors and may forget that the outside masonry is constantly exposed to the elements, opening it to the possibility of damage. When chimneys are exposed to the elements and subjected to freeze-thaw cycles, water can penetrate the masonry materials and accelerate the chimney’s deterioration. Not addressing the deterioration of a chimney can eventually result in costly repairs or even hazardous circumstances. Damage to a chimney from water penetration can include cracked flue liners, eroded mortar joints, rusted damper parts, stained brick, wall and ceiling water damage, rotten wood, and much more. There are 25,000 chimney fires every year in the U.S., mostly due to chimneys that are not well maintained. One of the best ways to protect your chimney from water damage is by making sure there is a properly installed chimney cap and chimney crown on the top of your chimney. 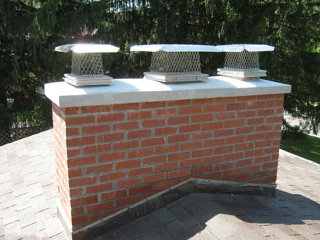 The chimney cap (also called a rain cover) is a stainless steel metal cage like box with a roof like top, which fits directly on top of the chimney flue liner. The chimney cap will keep rain and snow from directly entering down the chimney via the chimney flue. 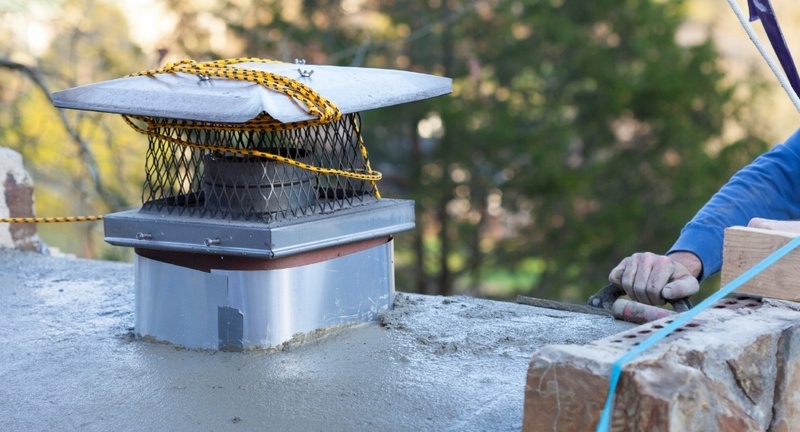 The chimney cap will also keep birds and other animals out of your chimney and will help contain large sparks from flying out of the chimney. The chimney cap should be easily removable for cleaning. The chimney crown (also called a chimney wash) is the top component of a chimney. It covers the top of the chimney from the flue liner to the edge. Often masons will use leftover mortar to make the chimney crown. Mortar, however, is not the best material to make a chimney crown with, because mortar crowns will often crack due to shrinkage, enabling water to penetrate the chimney beneath. The most highly recommended material for properly built chimney crowns is Portland based cement. Slopes away from the flue to the edges. Minimum of 3-4 inches thick near the flue. Minimum of 2 inches thick at the edge. Edge of the crown extends 2 inches out from the side of the chimney on all four sides, creating an overhang. Underside of the overhang has a capillary break (indented channel) or a ridge an inch back from the edge running the entire perimeter of the crown. This will force water that attempts to run on the underside of the crown overhang to fall on the roof before it reaches the chimney. Not bonded to the flue. As a safeguard, flashing should be used between the top of the chimney and the crown, so if cracks do form, water will still be diverted away from the chimney. The flashing should extend past the sides of the chimney and form a drip edge underneath the overhang of the crown. The flashing should also go through the layer of brick, through the gap between the brick and the flue, and then up the side of the flue to the top of the crown. Yearly examination of your chimney will help you avoid costly repairs down the road. Examination of your chimney should include examination of the crown for cracks and deterioration, examination of the caulking between the flue and the crown, examination of the chimney walls for cracking and staining, and examination of the mortar joints for deterioration. Yearly examination will help keep your chimney safe, functioning properly, and to last a life time.